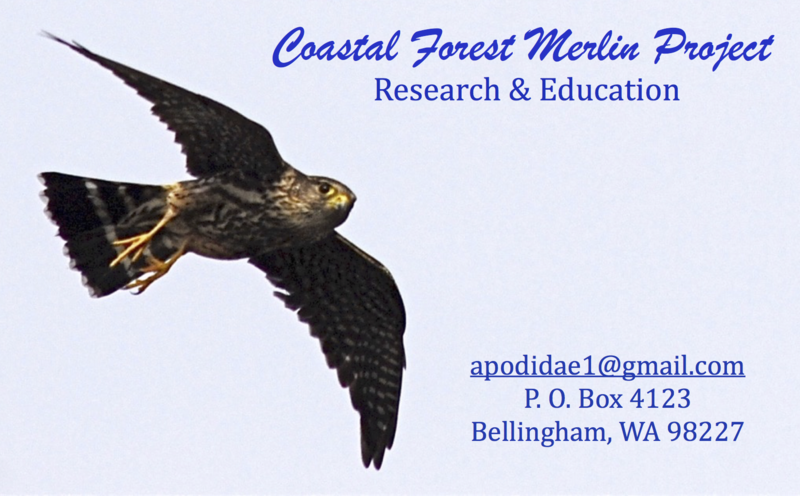 The Coastal Forest Merlin (aka “Black Merlin”), is a hawk-like raptor living in the Northwest Rain Forest. Today, the majority of people are not aware of its presence on our shared landscape. To some, ka’la ki’do was a small hawk in the ancient forest of standing elders. Still others believe Merlin was a spiritual wizard icon of long ago. For thousands of years, Merlin falcons have lived right here where you and I do. As these are our neighbors, we should get to know them better while we can. They are dazzling fliers with an intriguing lifestyle that you will find a lot of fun to learn more about! Team Merlin is our loyal and motivated group of volunteers from diverse interests and professions. They, like you, are the ones who get the job done! With over 33 years of research data collected, we need your help to get it organized, analyzed and published!! In this way, you can help the people of our region learn about this phantom falcon and its important role in our lives. Join us if you like to: learn about wildlife, contribute to your community and work/play on a rewarding project! Our education outreach would not be possible without people like you getting involved! We believe people helping from the heart make all the difference in the world! Everyone has something to contribute to better our lives. We nurture and support that kind of relationship with nature and celebrate the diversity we all share and enjoy in the Northwest.